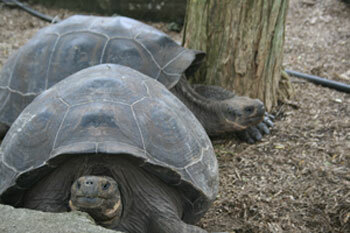 The Galapagos Islands got their name from the tortoises, which resembled a kind of saddle. Photos by Jon Brandt. It sounds like you’re in a tunnel, or you have ear plugs in, or you just went to a rock concert and have severely damaged your ears. But there are little noises and sounds of splashes on the surface, so you know that you can still hear things. There’s a clear view to the bottom and the rocks are just feet away, so when the current pushes you over you bump right into them, narrowly avoiding cutting your legs badly. You turn around, and then you realize that you’re smack dab in the middle of a school of fish that could care less about you. Frantically looking around to find a friend to share the excitement with, you realize that you’re all alone, and you just revel in the fact that you are one with the fish, connected only to the world above with an air tube. And then you put your head back up over the water and notice sea lions coming up for air as well. The Galápagos Islands, located about 1000 kilometers from mainland Ecuador, are home to a wide variety of land and sea life. The islands get their name from the old Spanish word “galápago,” which was a type of saddle. The first Spaniards to find the islands thought that both the shape of the islands and the tortoise shells resembled the saddles. With 12 main and 12 minor islands, you can spend about two weeks alone exploring each island and swimming in the surrounding areas. The more popular option is to stay on a boat and travel by night, but my friends and I were only in the islands for five days and on the cheap, so we stayed in a hotel on Santa Cruz. Crystal blue waters in the Galapagos. I’ve never been a very good swimmer — in fact one summer I was demoted from a Level 4 to Level 3 swimmer. Make no mistake about it, a large portion of the things to see and do in the Galápagos are nautically based, yet you can still have a great time even if you don’t get in the water. 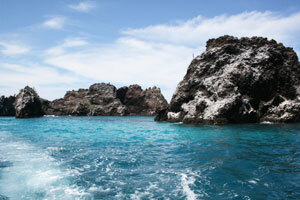 On the second day of the trip we headed out to a small volcanic island named Islas Daphne. The seas seemed a bit rough, but I jumped in just like everyone else. I immediately struggled in a strong current, and though I had the mask and air tube in, I was unable to breath easily. Yet I wanted to try snorkeling with my friends. We’d heard that you could get up close with schools of fish and other animals, and this was not something that I wanted to miss. As the rest of the group drifted off towards the rocks and the boat moved away, I knew I was in trouble. I doggy paddled as hard as I could but to no avail — I couldn’t move at all. I took the air tube out to breath easier, but instead just swallowed a lot of water. My muscles were exhausted from trying so hard, and eventually the captain saw me struggling and came over with the boat. When I got back on he asked what happened and I told him I couldn’t swim very well. The next minute I found myself sick over the side of the boat, probably from swallowing so much sea water and from the stress it put on me. Sitting on the side of the boat watching the others in the water, I was upset and worried that it could put a damper on the whole trip if I couldn’t snorkel. Once my friends got back on the boat and I heard about all the things they saw, I was jealous. But they were sympathetic and promised they would help me swim next time. The boat moved on to Isla Baltra, a small rocky island that was a U.S. Military base during World War II, housing 4,000 soldiers for an attack on the Panama Canal that never came. Now it hosts one of the main airports for the Galápagos.We went to a small beach with just a few feet of sand to stand on before brush emerged, where we couldn’t walk because of tortoise nests. The water was much calmer, and my friend Kristine helped me get the basics of snorkeling down. It took a few minutes to train my brain to realize that I could breathe underwater, but I finally got it down. Instead of struggling hard to swim, I floated and let the current take me along, and when I wanted to I was able to swim on. Down below I saw schools of fish eating, the intricate designs of the rocks, and other large fishes with amazingly blue and red stripes darting in between the rocks. I wasn’t a perfect swimmer by any means, but I was getting better. By the third day I was getting more adventurous, and when we went snorkeling off of Floreana, an island two hours south of Santa Cruz, I spread out looking for more sea life. Our guide Javier yelled out that there were sharks near him. We swam over and saw a school of sharks swimming around and eating. They weren’t Great Whites, but when you see a shark coming towards you, you tend to get a little nervous. At one point a shark came right up to me and I thought I was a goner. Back on the boat, Javier told us that the sharks can sense fear and get curious, so someone must have been afraid for them to swim close to us. I don’t know if I believe that, but I can’t blame someone for being afraid of sharks down below. Again, the water was incredibly clear and we could see everything below the surface. The sea lions were eating and playing right beneath us, and though they were so close we could touch them, we were told not to because they sometimes bite.We moved on to another spot where sea lions were sunbathing. Javier told us not to swim towards them or it would be an invasion of their territory, but if we were off to the side they would come to us, which they did. 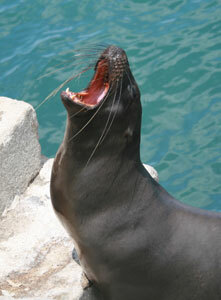 When you clap, a sea lion will look up and follow the noise. I was getting more comfortable with the swimming and even went diving, holding my breath for as long as I could, feeling the pressure building up on the mask, and then getting back to the surface as quickly as possible, pushing the limit even further each time. It was a great rush to be chasing fish and reaching out to touch them. It was a cat and mouse game of who could hold their breath longer, and the fish always won. There was something so calming and tranquil under the water. An entire universe of life existed down below. 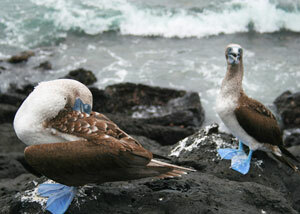 It was a sight that I had rarely been able to witness, and certainly not to the extent that you can in the Galápagos. The islands are unique because it’s one of the few places in the world where the animals have no fear of the humans because humans have never been a big predator to them. Down under the water, all of the problems up above dissolve and you simply float with the current, watching the fish like a spectator at a sporting event. I am no Michael Phelps, but I was able to overcome my weaknesses as a swimmer and snorkel with the others in the group. Back on the boat, the vicious sun cracked my lips and baked my skin, but the wind breezed through across the Pacific and we headed back to Santa Cruz. An adventure definitely worth the pain. I flew TAME from Guayaquil, but you can also go with AeroGal. All flights must leave from Ecuador, so either Quito or Guayaquil are the easiest options. 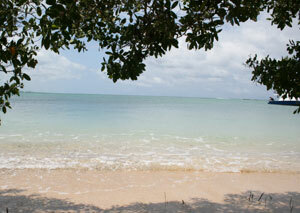 The flight from Guayaquil takes a little over an hour and you gain an hour in Baltra. Many people choose to stay on cruise ships so they can travel to farther away islands at night, but if you’re looking to save money or you get sea sick, you can stay in Puerto Ayoro on Santa Cruz. The largest town in the Galápagos, with 12,000 people, Santa Cruz has a number of hotels, restaurants, and bars. We stayed at Hotel Ninfa, a nice mid-range hotel with a pool, bar, and air conditioned rooms. Anytime of year is good to go to the Galápagos, yet the hottest and rainiest month is February, which is also usually the height of tourism. Prices drop considerably after Carnaval (around mid-February). Remember, the prices change, but the animals don’t, so if you find a cheaper deal in September, take it. Booking in advance is nice for security, but if you wait until the last minute you can often get great deals that knock off hundreds of dollars. It’s reiterated by every tour guide, but important to remember to not touch any of the animals, even if they seem OK with it. Never take any rocks or animals from the islands with you, only photographs. If security at the airport catches you taking something other than store-bought souvenirs, you will face fines and some serious trouble. The Galápagos Islands are a national park, and as such it costs money just to enter. Before you leave the airport in Quito or Guayaquil you need to pay $10 for a Galápagos ID card, which really does nothing. Then before you can leave the airport in the Galápagos you must pay a park entrance fee. Ecuadorians pay $6, South Americans from other countries pay $50, and all other tourists pay $100. This is non-negotiable and must be paid in cash before leaving the airport. Some tour companies will include snorkel gear, but if not a typical rental should be $2.50 a day for the mask and air tube, or $5 with flippers. The Galápagos is the most expensive part of Ecuador because everything is imported, so a meal can cost upwards of $6-7, and a drink can cost $3-5. Water will cost around 60-80 cents. Ecuador uses the U.S. Dollar, and several banks and ATMs can be found on Santa Cruz. Jon Brandt is currently volunteering as an English teacher in Cuenca, Ecuador. When he's not working he tries to travel as much as possible. .